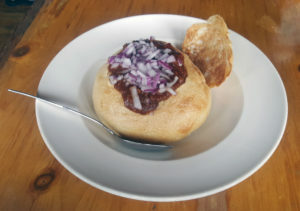 Today’s lunch special was Chilli, shown here in a Bread Bowl. Copyright © 2019 Old Stone Station Restaurant. All rights reserved. 18% Gratuity is added for parties 6 or more. Prices, descriptions and availability subject to change. It is advised that eating raw or under cooked beef, eggs, poultry, pork. or shellfish may increase your risk for food-borne illness. Please be advised that food prepared here may contain these ingredients: milk, eggs, wheat, soybeans, peanuts, tree nuts, fish and shellfish.